It has been 16 months since Polar came (wheeling) into my life my how time flies!!! I am not sure were to start but I have never had any doubts about were Polar was meant to be!! He is such an inspiration each day to watch and learn from, he never ever ever has a down day, and he just looks forward to the next big adventure. I am lucky enough to be along for his ride and can constantly see him growing and changing with each new experience we encounter. He truly has added a new dimension to my life which I love!! I am very grateful to GRRI-NJ for taking him into the rescue and going the extra miles for him to try to figure out what his prognosis would be, I'm not sure that many other rescue organizations would have done that. Everyone in the rescue should be very proud of how far Polar has come now, he is able to get himself up and walk, he doesn't use the wheelchair much, as he prefers to walk!! Polar has no limitations with what he is capable of doing, everything can be adapted. Polar is just like any "normal golden" of 18 months, he runs and plays, chases rabbits & kitties and is always smiling!! The one thing I have learned from Polar is to be happy with what you have and make the most of it, don't dwell on what you can't do, but do what you can do the best. More people should be like Polar!! Thanks again for letting him be a part of my life, I can't wait to see what our future holds!! Dear Pam, Thanks so much for the nice note. We're very grateful for all you've done for Polar, and its wonderful to see and hear how well he's doing. 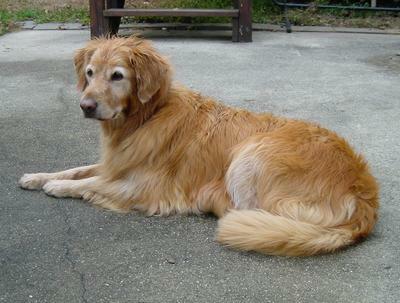 Enclosed are some pictures of "Dakota", our adopted 8-yr old golden. We adore her. She has adapted wonderfully, loves her new home and our shore home. Thank you so much for bringing her into our lives. Dear Fran & Frank, Letters like yours are what rescue is all about. Thank you! Anyone who does not want a senior dog should listen to this. My Rosie, they say she is 12, is amazing. 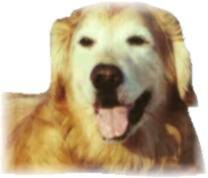 I have had several Goldens, all living to ripe old ages but suffering at the end from arthritis, cancer and so on. Along comes Rose -- Not a breed ring champ. She is tiny and I wonder if she is a mix, a puppy mill dog or a field Golden. Whatever she is, she is one of the best dogs I have ever had. 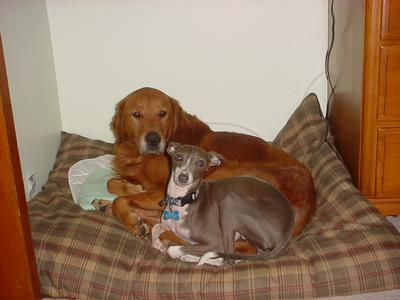 She is super smart, very agile and active, loves kids and is so gentle with babies on up. She gets along with dogs of all ages and sizes -- she just knows how to handle herself. She loves to travel with me in the car on trips or on short errands. She loves people, almost a fault, as she just can't get enough attention. We have been to shopping centers, nursing homes, in elevators, on scary steps, etc. She is as stable as a rock. She does have issues still -- very food attentive. She is obsessed with food -- understandable knowing her past. This is a good thing when it comes to training. Her collar issues are gone and so is her fear of boards, sticks, anything happening over her head. She has learned to play with toys and with other dogs. She loves our long walks, she can run like the wind. This girl is really amazing to me -- she is such fun and she is so thrilled to be loved. She also very much enjoys the comforts of a real home -- good food, lots of fresh water, treats, friends -- human and canine -- good vet care, training, play, a warm and comfy next next to my bed each night. We graduated today from basic obedience -- no, on to a bit more advanced and our CGC. Soon after that, therapy dog testing -- she will fly through that. We also are going to be doing intro to agility -- low key and fun and Rose will love it. And she is capable. Thanks again for my Rose. I could not have asked for a better girl for me, my family, my neighbors, friends and other doggies that visit. However, she is beautiful to me. Her feathers are growing, a very good sign. Ready to move forward when I saw things were fine. Rosie is feeling more secure. We are ready to open the Therapy Dog Door. So intro to agility will be done with ease. People, kids and dogs, she has a ball. So small they are, they may stay in the sack. A better match could never be. 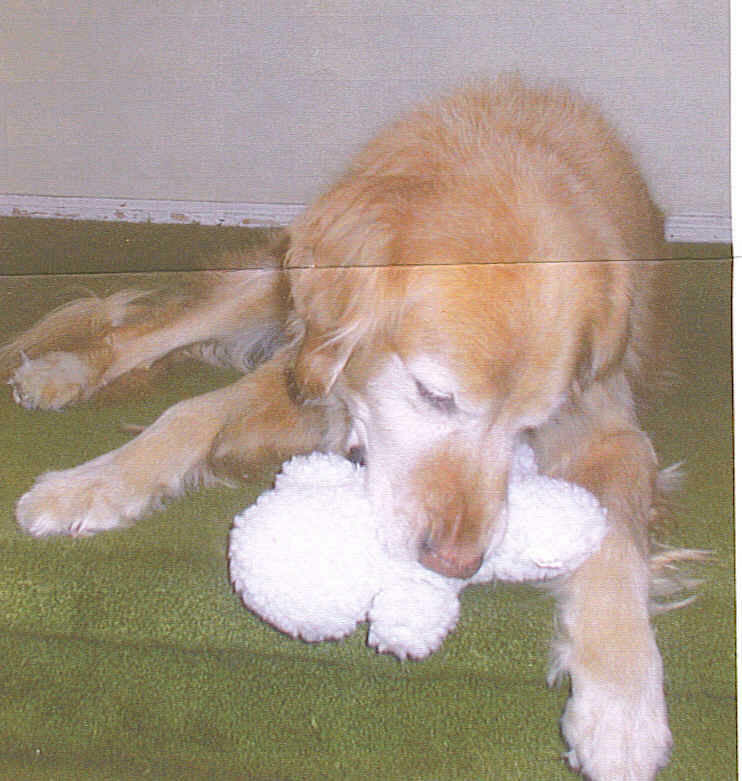 Thank you all at Golden Retriever Rescue for finding me my "Miracle Rose". This thank you note is way overdue. 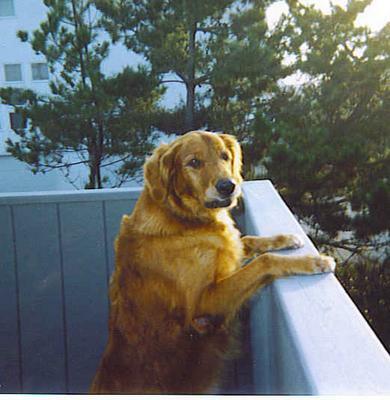 I am writing to tell you all how much I appreciate you hooking us up with Astro, our Golden Retriever Rescue. In April I got the call that my "perfect" dog was found. 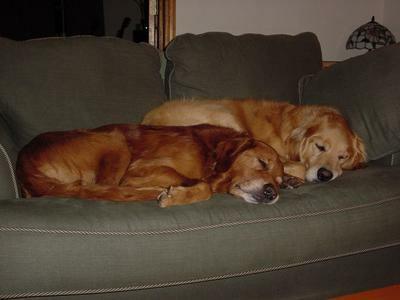 I needed a Golden who didn't mind children, cats or chaos. Astro came to us by way of [GRRI volunteer] Terry Viega. He tipped the scale at 150 pounds when his foster mom got him. It was easy to see the young (only six! ), fun-loving guy in that overweight body. Thanks to diet, exercise, pain management and thyroid hormone, Astro weighs 75 pounds today. He is an energetic guy, with a heart of gold. He tolerates life's indignities gracefully, including sharing his water bowl with the cats and dental exams by a toddler. He has slipped into our daily routine easily and loves being part of our family. 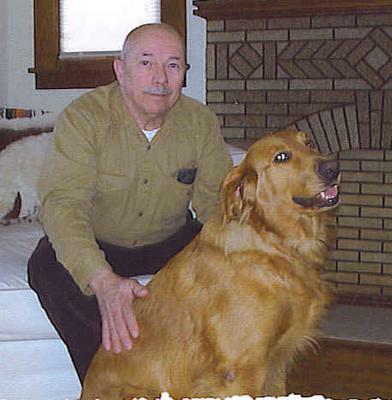 I can't thank you enough for your dedication to this joyful breed and for our Golden. Dear Rachel, WOW, a 75 lb weight loss! Thanks for giving Astro the diet, exercise and love he needs. Well, now you can say that someone adopted a dog after your home visit! I'd say about 2 weeks after we met I inquired about Barnabus on the GRRI website. His foster mom called me the next day and we were introduced to him at Petco two nights later. The rest is history. He is THE BEST dog. He makes Sam look so bad. I try to remember that Sam is still a teenager, whereas Barn or Barney (as we call him now) is much more mature. No one is really sure of his age. He is so sweet and cuddley, a typical velcro golden. He is also extremely well behaved. He is most definitely the "alpha" male. Sam isn't that happy to taking the backseat, but seems to be adjusting as the days go on. Overall it has been a success! Enjoy the picture! If you are forwarding my last email to Eileen [GRRI Volunteer] you must mention that I think Barn's foster mom, Luanne, is the best. What a wonderful person. She is truly an angel. She really has inspired me to be a better person. We were very impressed with GRRI and tell everyone about your great organization. I still visit the website to see who's in and who's out and even have co-worker's cheering for the dogs available for adoption. I actually did some Christmas shopping through the sponsor's links. Even bought some stuff for ourselves too! So, please forward to Eileen, tell her we said hi and have a wonderful holiday! Here's another good pic! Dear Amy & Ron, Thanks for the notes, photos, updates and kind words about our volunteers. Please keep us posted on how Barnabas is doing. I've been here a while and I guess I'm gonna stay. My people spoil me and I like it that way. Thanks so much for hooking us up. I wish I'd been here since I was a pup. I was a bit concerned when a new grandbaby came along. But this is my home - it's where I belong. I've been here three years - how the time has flown. I spend my afternoons with tennis balls; my evenings with a bone. There is a warm place for me at the end of the bed. Oh -- there is no place like home. I end every day with a kiss on the head! Thank you for all you've done for me and my Golden Retriever brothers and sisters. Dear Moses (and Andrea & Tony, too), Great to hear that you're living large! Enjoy!! Thank you to [GRRI Volunteer] Mary Jane Roethlin and everyone who helped find Rocky a new home. Everyone involved with the process helped ease my anxiety through this difficult time. I appreciate all you did. Dear Carolyn, We're glad we could help. Can't believe that it is now 3 weeks and 1 day that Lacey has been living with us. She has adjusted well here to our surprise. She is such a sweet girl, that anyone that meets her for the first time just adores her. She has gained about 5 lbs since being here, but looks great. She spends the day having freedom in our home. We do not have her blocked into the family room, like originally. That lasted about 3 days. We knew that we could trust her. Over the weekend we stayed outside pretty much all day. John mowing the lawn and I doing leaves. I thought she would want to help, but she just laid in the sun and relaxed. We take her for a walk at least once a day, on the weekend we try and take her in the morning and in the evening. Loves to go for her walk, and sight see. Right now we are having a thunder and lightning storm, and she is not happy about it. Very nervous, and jittery. But I can feel for her, because I don't like this weather either. John is sitting with her now, in fact she has jumped on the couch for the first time since being here. She seems really scared about the storm. 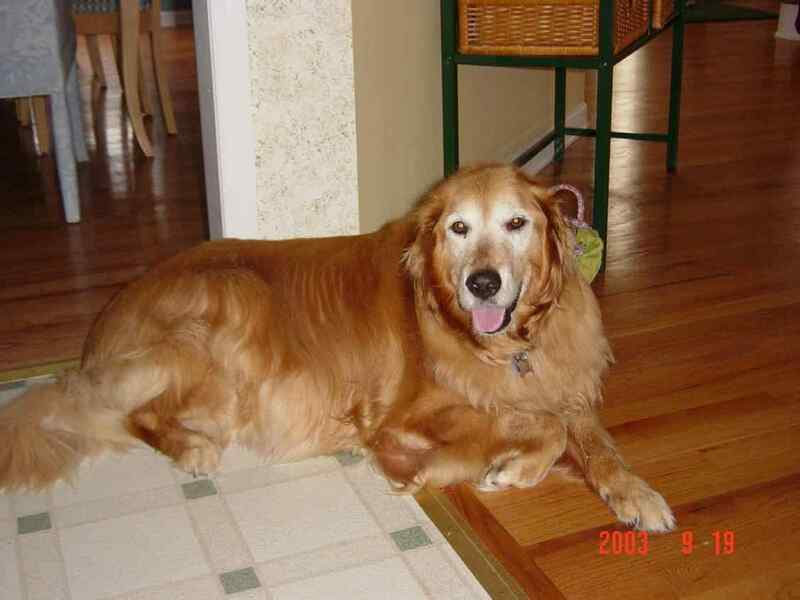 But all in all we could not have asked for a better companion then Lacey Girl, as we call her. We show her so much love, and in return she is starting to show us she trusts us. We did notice that when we go to pet her head, she pulls back as if we are going to strike her. We just keep reassuring her that we will not hurt her. She is a good watch dog. Barks to alert us to anything, when needed. She lets us know when she has to go out, and when bedtime comes and she is tired she just goes upstairs and plops on her bed. Doesn't wait for us. Sometimes she is first to go up. But if John or I go to bed first, she will follow. So what can we say but thank you for being at the dog show and having Lacey with you. We probably would have taken Allie too if she was not yours. We have no regrets about adopting an older dog. Our senior angel. We took her to the vet and he couldn't believe how healthy she was for her age. In fact I think he was very surprised. We did not put her on heartworm now because it is getting colder, and as long as her blood test came back negative they suggested not giving her anything at this time. But in March we will take her in for blood work and put her on heartworm meds. I did put some advantage on her for flea & ticks just to be on the safe side, because she does like to roll around on the lawn. How is Allie doing? Did she adjust well to not having Lacey around. Anytime you would like to see Lacey you know you are welcomed here. I've attached a picture so you can see that she is doing well. I will keep in touch with you periodically with updates on Lacey. Hope all is well with you and Allie. Take care and thank you again for our little angel. With sincere thanks, hugs & kisses, and Lacey sends a big lick. 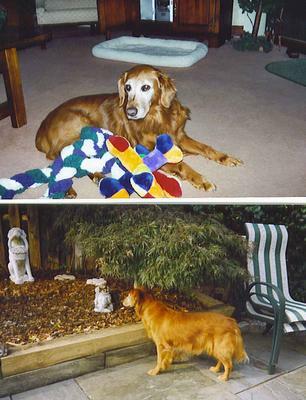 Dear John & Chris, Thanks for giving such a wonderful home to your senior angel. Those white faces melt our hearts every time! We begin by wishing you and your family a blessed New Year. 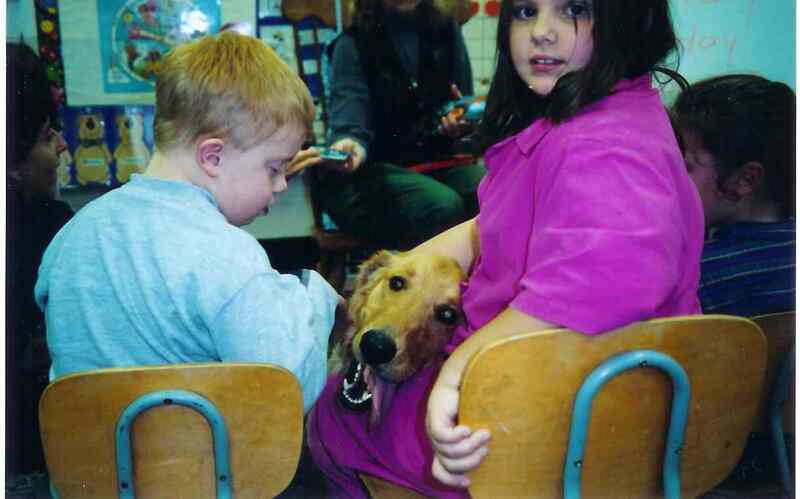 Last March we adopted a beautiful Golden Retriever boy; you may remember him as Nick and his foster mom was Linda Schnorrbusch in New Jersey. At that time he was unable to go up and down the stairs. He would make the first step and that's it. With much love and patience we are delighted to report that now he is able to make the stairs. 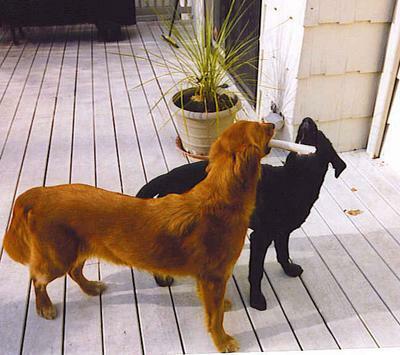 This past summer my husband and I, Lars, our almost 13-yr old Cocker Spaniel, and Ben went to Long Island and stayed at an old farmhouse with sleeping quarters in the second floor. Since we always sleep in the same room we were concerned how we and Ben were going to deal with the situation. That's when Ben decided that it was time to conquer his fears. With my husband's patience and loving words of encouragement our beautiful Golden Retriever met success. We are so happy with him. He is our tallest and biggest Golden yet but he is very gentle with our small grandchildren. He steals goodies and socks from the little ones but that is a small price to pay from all the joy he brings to our lives. Thank you for allowing us to adopt Ben. PS - enclosed is a contribution to help with the good work. Dear Esmee & Dave, We're delighted to hear how well Ben is coming along. Yay about the stairs!!! Love, time, and patience can really do wonders, as Ben and other rescue dogs prove over and over. Thanks so much for the update, and for the donation as well! I just finally read the full GRRI newsletter and was surprised to see my email in there! The stories that people wrote were so loving and heart wrenching. How special. Thank you for sharing them. It's hard to photograph a black dog, but here are some photos to show you what a great mom Daisy is to Nate! We adopted Daisy from you 8/13/00. THANK YOU EVERY DAY!!! Dear Peggy, We love the letters we get from adopters. It means so much to us to read how well loved the dogs are in their new homes ... we're glad to hear you enjoy the letters just as much. 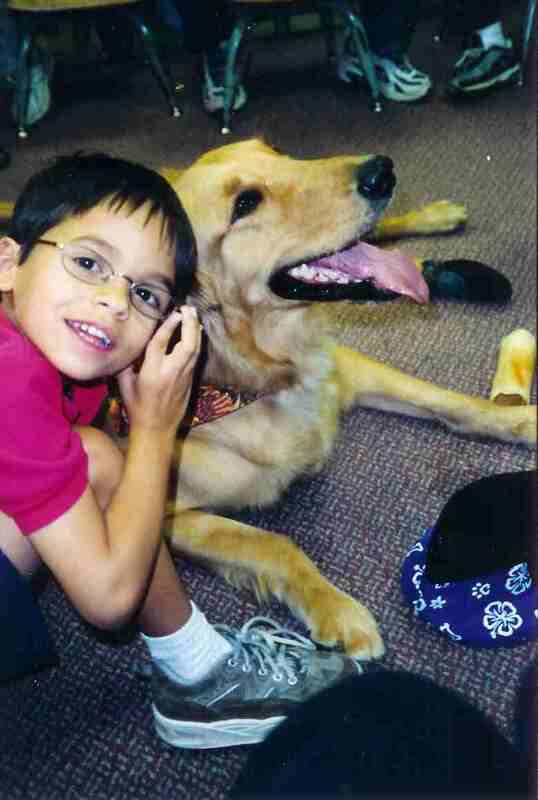 Hugs to Daisy, and continued success with raising Nate for the Seeing Eye!